The Game chick feeder's sturdy plastic construction allows it to hold five (5) pounds of feed. The feed is on a continuous flow basis so that the oldest feed is eaten first. Most important of all, the chicks do not have droppings in the feed. Size: 12 1/4" long, 6" wide, 5 1/2" high, gives 24 1/2 " of feed space. 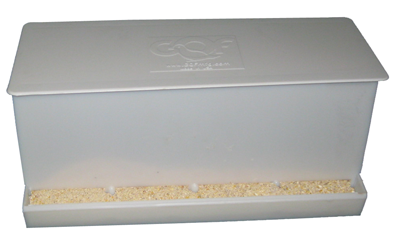 Feed level can be seen through the side wall without having to remove the lid.